The Shuttle launch date has been rolled back to July. The workforce is still pressing on to get everything ready for liftoff. I have to leave here on the morning of Mother’s Day to fly to Albuquerque. Am I in trouble? My wife has been introducing me as her first husband for the past week. I’ll have to do something spectacular this Saturday to make up for leaving her on Mother’s Day. Wish me luck. I’ll start with an apology for last issue. I showed a picture of Bob and Ginny McNaughton and identified Ginny as Bob’s first wife, Gretchen, who had died several years ago. I don’t know how I did that but it was a bad mistake. I hope I never do that again. Once again, my sincere apologies. I saw Colin Richardson several times in the past few weeks and he is doing very well after his fall from a ladder onto his driveway. (I would like to say the injury was minimal because he landed on his head but can’t.) He landed and hurt his back. The back injury is not as bad as originally diagnosed. He is not wearing a back brace anymore and is doing very well. We downed a couple of drinks at a local pub and told old war stories. By the way, Colin thinks the Global Warming Theory is just that, a theory. If you are a proponent of the Global Warming Theory, you can have many scientific email exchanges with Colin. Just let me know if you need his email address. Fred and Helen Hendryx were in town a couple of weeks ago. Willie and Nancy Gray, Lyle and Susan Wilson and Caroline and I got together with them for dinner. Fred was here to repair the hurricane damage to his Mom’s house in Melbourne. She had to move out of it and into Fred’s brother’s house. After the house is repaired, they plan to sell it. So Fred worked his tail off for 2-3 weeks and was planning a short boar hunting expedition into the deep jungles of central Florida with Tom Young. Not sure how that turned out. Willie is fully retired, at least for now. 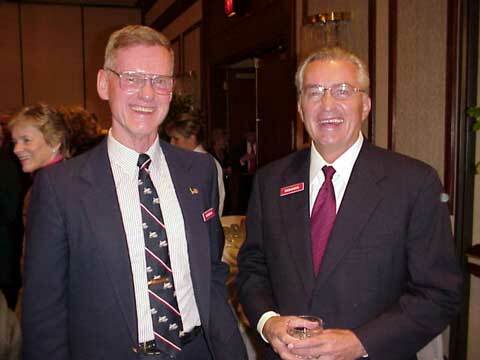 He told me that same thing twice before and went back to work at the slightest hint that Lockheed-Martin needed him. He told us that he has a new hobby besides golf. He opined that he is getting good at poker. He visits the local racetrack occasionally to play poker and almost always comes home a winner. I thought that if he was that good he should write a book about his style of poker. I’m going to see if I can get some lessons from him and sign up for the World Poker Tour competition. Nancy said she is still teaching at the local Montessori School. She just loves that interaction with the kiddies too much. Lyle is still flying executive jets but had an annual physical to pass. We’ll see how that comes out... UPDATE: The physical results led to further tests and finally arterial surgery was scheduled for Monday, the 9th, at 7:30 a.m. There are 2 blocked arteries - 90% and 60% blockages. - 4 to 5 days in the hospital. Susan said that he is now doing fine (end of Update). And his wife, Susan is still doing a great job at NASCAR. (No, she’s not a Crew Chief.) She works in the scheduling and management of special events (I think. Sounds good anyway). My wife is still the Base Housing Officer at Patrick and was happy that Patrick survived the BRAC list. However, the base will be losing a Navy unit and will lose some housing requirements. Got an instant email from Brad Van Sant back in January. Here is his update. He is still in Woodland, CA., and has been a Presbyterian Minister since 1985. He said he retired last year but then a local church asked him to be their interim Pastor. You know how that goes. His retirement only lasted three weeks. He and wife enjoy it near Sacramento. Their daughter and grandkids live nearby in Davis, CA. He said he saw my column in Checkpoints and responded by emailing me. I asked him about age being a burden on him. He responded, "Are you kidding! A year ago I started visiting an exercise and tennis club. Boy, do the joints and muscles not respond like they used to. But it has been good for me. I can get out of the car and the Cessna that I fly locally at the Aero Club without falling down. I’ve lost hearing in one ear. Probably all those years in the Tweet and other aircraft." As we signed off. I thought that it was good hearing from Brad after all these years. I dug out a picture from our 40th Reunion for your viewing pleasure (see above). 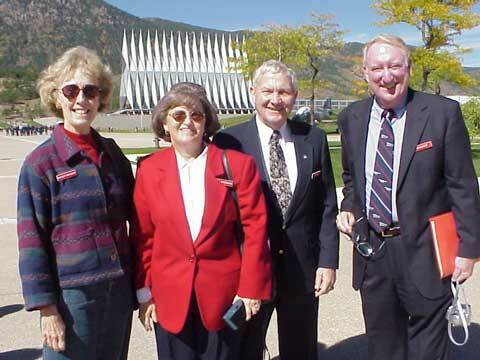 Nancy and Brad Van Sant surround Linda and Bill Browning. 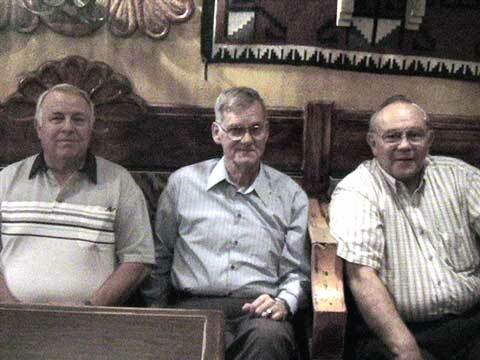 I just returned from a trip to Albuquerque and had a Redtag Get Together with John Brothers and Peter Robinson. John is fully retired and enjoying his chance to work out a few hours every day. He says he hasn’t been able to lose much weight but he’s in good shape. His wife has recovered very nicely from her kidney transplant and is doing well. Peter has fully retired but he accepts an occasional consultant assignment. His wife has gotten into hiking and enjoys that very much. A picture of the three of us is nearby. John is on the left, Peter is in the middle and I am on the right. Don’t we look like we are sitting in a proctologist’s office…waiting. Anyway, it was great spending some time with other Redtags. And the weather was gorgeous. I thought it would be nice to insert another 40th Reunion picture. This one has the two Robinsons together. (They are not related by blood for those of you who are not Redtags. They are related by Trial by Fire.) Peter Robinson is on the left and Paul Robinson is on the right. I think we all should consider meeting once between five-year reunions. As time passes, fewer of us will be left. For example, I know that many veterans groups still meet yearly or biannually. I know of one West Point class that meets every two years. I thought there might be some of you who would like to meet in another location somewhere around the US. I don’t think the AOG would or could support an off year reunion. We could pick a nice location with the kinds of events and attractions that we like to attend and get together to solve the world’s problems and compare our own group of medical people that keep us awake, walking, hearing and seeing beyond our capabilities. Please let me know by email if any of you are interested in doing this. Well, that about wraps it up. Please keep the emails coming.